Payment Instructions: PLEASE NOTE!!!! * All invoices under $10,000.00 DUE on date of sale. Remaining invoices are due within three (3) banking days of the completion of the Auction, Friday, April 12, 2019. * NAMES ON INVOICE CANNOT BE CHANGED AFTER AUCTION DAY. Please check your invoice name for accuracy. THE NAME SHOWN ON YOUR INVOICE IS THE NAME THAT WILL APPEAR ON THE TITLES TO THE ASSETS YOU HAVE PURCHASED. NO EXCEPTIONS! * Method of payment: Cash, wire transfer, certified check or personal/company checks if they are accompanied by an irrevocable letter of guarantee from your bank. No purchase will be released without payment as described above or until non-certified funds clear our bank. Notification of checks that have cleared our bank may take up to 10 banking days. PLEASE NOTE: Purchases up to $2500.00 may be paid by Credit Card, a 4% Convenience Fee will be applicable with credit card payments. * Administrative Fee: All purchased lots will be subject to an administrative fee of 10% on the first $2,500 and 5% on the remaining balance per lot. Online buyers will be subject to an additional 2% Proxibid, for a total of 12% on first $2,500 and 7% on the remaining balance per lot. * Taxes: Texas Sales Tax of 8.25% is payable on all equipment purchases. Texas Motor Vehicle Sales Tax of 6.25% for all titled items registered in Texas. Texas TERP Tax of 1.5% for all off road, heavy duty, diesel equipment 50 horsepower engines or more. Shipping Instructions: Shipping is Buyer's Responsibility. Please contact Beazley Auctioneers for general shipping and handling information. PLEASE NOTE: WE ARE NOT A SHIPPER! Buyer responsible for load out. All equipment must be removed by Friday, April 12, 2019 or equipment will be considered abandoned. NO EXCEPTIONS! Items cannot be removed until entire invoice is paid in full; Insurance and removal is the buyer’s responsibility. Yard gates close promptly at 4:00PM. Trucks for pick-up must be in the yard ½ hour before closing. Before equipment will be released from the yard all purchases must be paid in full and release ticket(s) obtained from a Beazley Auctioneers Employee. Driving Directions: [Yard 1] 5540 Andrews Hwy, Odessa, TX 79762 - Equipment Yard located behind building along road. TERMS OF BIDDING AND SALE (“Terms”) 1. Beazley Auctioneers (“Auctioneers”) hereby grants to the party whose signature, or electronic acceptance, or placing a bid, appears on the Bidder’s Registration Agreement (“Bidder”), the right to use the number (“Bidder Number”) shown hereon for the purpose of bidding at an auction sale to be conducted by Auctioneers. Such right is granted at the Auctioneers’ sole discretion and may be revoked at any time. 2. Bidder acknowledges he has received, read, and understands these Terms, a copy of which are printed on the inside cover of the Listing Catalog, as well as any Real Estate Terms and Conditions provided therein, and agrees to comply with and be bound by such. 3. The Bidder offering the highest bid accepted by the Auctioneers shall be the Purchaser (“Purchaser”) of the offered lot (“Purchase”) and no Purchaser shall retract his bid. Purchaser accepts a Lot when he makes a bid. All sales are final. 4. Bidder, acting in any capacity whatsoever, and the company he represents, both jointly and severally agree: (a) to indemnify and save harmless Auctioneers and its consignors (“Consignors”) from any and all actions, causes of action, suits, damages, costs and losses of any nature, arising from the purchase or use of any item, or the attendance or participation of Bidder, his agents or employees, at the auction sale and/or on the auction site whether before, during or after the auction sale; (b) to be responsible for the payment of the purchase price and taxes due on all Purchases using the Bidder Number regardless of whether it is in the Bidder’s possession or not; (c) that all rights and defenses available to Auctioneers hereunder shall extend to the Consignor. 5. These Terms shall be governed by and interpreted under the laws of the State of Texas without giving effect to any of the principles of conflicts of laws or the United Nations Convention on Contracts for the International Sale of Goods. Absent agreement by the parties, any action arising from or relating to these Terms or any bid or purchase hereunder shall be commenced in a State or Federal Court in Collin County, Texas, and Bidder irrevocably consents to the exclusive jurisdiction of such courts. 6. The Auctioneer may at its discretion require Bidder to provide a deposit as a condition of being registered to bid, which deposit becomes non-refundable when Bidder makes a purchase and may be applied at Auctioneers’ sole discretion against purchases made by Bidder. The Bidder grants to the Auctioneers a security interest in the Purchases to secure payment of the purchase price. In the event of non-payment, the Auctioneers may proceed to file the Bidder Registration Agreement as a financing statement to perfect the security interest granted by this Security Agreement. 7. There shall be no guarantees or warranties, expressed or implied, statutory or otherwise of any nature whatsoever in respect of the Lots offered at the auction. Each and every lot will be sold ‘as is, where is’. Specifically, but without limitation, Auctioneers make no representation or warranty that any of the Lots: (a) conform to any standard in respect of safety, pollution or hazardous material or to any standard or requirement of any applicable authority, law or regulation, or (b) are fit for any particular purpose, or (c) are of any particular age, year of manufacture, model, make or condition. Bidder agrees he has satisfied himself and is not relying on Auctioneers, nor are Auctioneers liable, for any matter in respect of the above. Bidder further agrees to repair, at his cost, any lot purchased at the sale to a safe operating condition and, without limitation to a condition which meets any standard or requirement of any applicable authority, law or regulation including those concerning any use to which the lot may be put. 8. Bidder acknowledges that an auction site is a potentially dangerous place. Flammable noxious, corrosive, and pressurized substances are present, heavy equipment is being operated and electric circuits may be live. Every person at the auction site at any time, shall be there at his own risk with notice of the condition of the premises and the activities thereon and Bidder shall so advise his agents and employees. No person shall have any claim against Auctioneers, their agents, employees, or principles for any injuries sustained, nor for damages to or loss of property which may occur from any cause whatsoever. 9. If the Bidder registered for this Bidder Number has registered at this auction under other Bidder Numbers, all purchases under all Bidder Numbers shall be considered for the purposes of interpreting the Terms, as if purchased under a single Bidder Number. 10. Auctioneers, at any time, and at their sole discretion, without notice or liability to buyer may: (a) withdraw or cancel the sale of any Lot, or (b) offer any Lots in groups or with privilege. Auctioneer reserves the right to place and manage bids on behalf of absentee bidders. 11. Any dispute arising as to any bidding shall be settled by Auctioneers at their sole discretion and Auctioneers may put the Lot in dispute up for sale again. Auctioneers reserve the right to refuse any bid which they consider to be an insignificant advance over the preceding bid. 12. Purchases become the responsibility of and shall be at the risk of Purchaser upon acceptance of his bid. It shall be the responsibility of Purchaser to insure his purchases immediately. Auctioneers shall not be responsible for loss or damage to any purchase. 13. All purchased lots will be subject to an administrative fee of 10% on the first $2,500 and 5% on the remaining balance per lot. Online buyers will be subject to an additional 2% Proxibid fee, for a total of 12% on first $2,500 and 7% on the remaining balance per lot. A 4% convenience fee will be applicable to credit card purchases. 14. All payments must be made by cash, cashier’s check, or regular check accompanied by a Bank guarantee acceptable to Auctioneers. All amounts under $10,000 due on sale day, any outstanding balance must be paid within three (3) business days of the completion of the auction. If Beazley Auctioneers does not receive full payment within three (3) business days of the completion of the auction, your credit card may be charged automatically, plus a 4% Convenience Fee will be applied to the transaction. Payments received on account of this or any other auction may, at the Auctioneer’s discretion, be first applied to prior outstanding accounts. Purchases will not be released until all accounts are paid. At Auctioneer’s discretion, any proceeds due to Purchaser under a contract to auction maybe set off against any outstanding accounts. 15. Purchaser shall not be entitled to possession of any of his Purchases until the total purchase price all his Purchases including all applicable goods, sales or use taxes, has been fully paid. In the event Purchaser fails to pay the amount due within the prescribed time, or fails to comply with any Terms, Auctioneers shall retain a possessory lien on all Purchases of Purchaser and at Auctioneers’ sole discretion have the right to resell such Purchases by public or private sale without notice to the Purchaser. Should Auctioneers resell any Purchase, the net proceeds there from (after deducting a commission of (a) 15% on all Lots reselling for more than $2,500; (b) 25% on Lots reselling for $2,500 or less with a minimum commission of $100 per Lot; and (c) any costs) shall be credited to the original Purchaser’s account and the original Purchaser shall forthwith upon demand pay Auctioneers, as damages any deficiency arising from the resale. In the event Purchaser fails to pay, Purchaser shall be obligated to pay buyer’s premium and sellers commissions to Auctioneer upon demand. 16. All purchases must be removed from the auction site within the time announced or posted at the auction site and all costs, responsibility and risk of such removal shall be borne by Purchase. Auctioneers reserve the right to require proof of adequate insurance coverage from any Purchaser for Purchases requiring dismantling, rigging or hot cutting. If for any reason Purchaser fails to remove any Purchase within the time specified by Auctioneer, the Purchase shall be subject to storage charges at $25 per day, per lot, and may be deemed abandoned by the Purchaser. In such event, Auctioneers, at their sole discretion, may resell per term (15) above, or remove and store the said Purchase at Purchaser’s sole risk and expense. Purchaser shall be liable for any rent incurred or damages suffered by Auctioneers because of Purchaser’s failure to remove any purchase. 17. The Listing Catalog has been prepared as a guide only, based on information from sources believed to be reliable and from the Consignor; however, its accuracy cannot be guaranteed or warranted. No sale shall be invalidated; nor shall Auctioneers be liable as a result of defects or inaccuracies in the Listing Catalog. 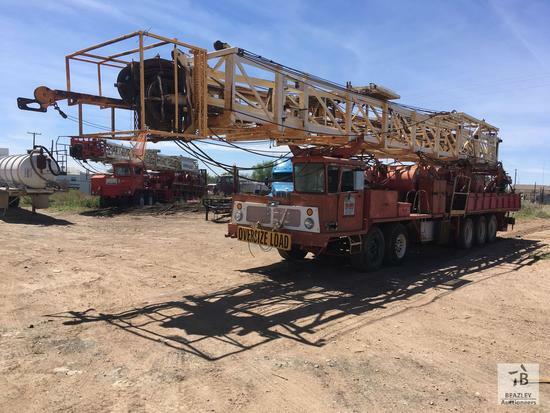 Bidder acknowledges that all Lots were available for inspection prior to the Auction and that it is his responsibility to inspect all equipment and to make his own inquiries prior to bidding. 18. All necessary documents will, if available, be delivered immediately to Purchaser upon payment in full as set out above, or will otherwise be mailed ten (10) banking days after payment is received. Documents will be prepared to be effective only in the jurisdiction in which the auction is being conducted. 19. If, for any reason, Auctioneers are unable to make available or deliver any Purchase or clear title to the same, or documentation required in respect of any Purchase, whether before or after delivery, Auctioneers’ sole liability, if any, shall be the return of monies paid in respect of such Purchase upon its return by Purchaser. Any such Purchase, for which clear title cannot be provided, shall be returned and surrendered to the Auctioneers upon demand. 20. Interest on overdue amounts will be paid by Purchaser at a rate of 18% per annum or at such other maximum rate as allowed by law, together with any legal or collection costs incurred by Auctioneers. 21. (a) If a Purchaser claims an exemption based on goods being shipped out of state for use out of state, then the goods must be delivered to and shipped by common carrier. (b) In such case, Purchaser shall arrange for and assume all risks and costs associated therewith. 22. The Bidder consents to the Auctioneers using the information provided in the Bidder Registration Agreement for internal marketing purposes and to assist the Auctioneers in refining and improving its services. All information will be retained in accordance with the Auctioneers Privacy Statement, available at www.beazleyauction.com. 23. These are the complete Terms and may not be amended except by agreement in writing signed by Auctioneers and the respective Purchaser.